Transform your cluster of keys to a neatly organized stack. You can arrange keys in your order of preference, which will help you locate the right key quickly and effortlessly. The Premium Key Fob is handcrafted and made from genuine leather. Dimensions: 3" x 0.77" x 0.67"
Like many product innovations, the idea behind Orbitkey was born from frustration. Co-founder Charles Ng didn’t care for the way his traditional key ring jangled in his pocket while jogging. If only he could clamp his keys together . . . After sharing a makeshift prototype with family and friends, Charles and his high school pal Rex Kuo teamed up to create Orbitkey. What began as a simple clamp evolved into a versatile, customizable key fob available in your choice of durable elastomer colors or leather styles. 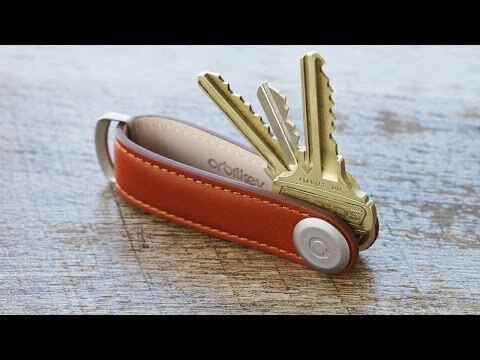 Designed to enable you to stack your keys neatly together or fan them out for easy viewing and access, Orbitkey is simple to adjust and tighten and can accommodate keys of varying shapes. It can even hold its very own bottle opener. No wonder these young Australian entrepreneurs raised 2000% of their Kickstarter goal.